The Great scientist Subhash Mukhopadhyay was born in Calcutta in India. He was educated at the Scottish Church College and after that he joined at the Calcutta Medical College, which was then affiliated to the University of Calcutta. His life and death has been the subject of countless newspaper reviews and a Bollywood film directed Tapan Sinha entitled “Ek Doctor ki Maut” (Death of a Physician). Dr. Subhash Mukhopadhyay created history when he became the first physician in India and second in the world after British physician Patrick Steptoe and Robert Edwards to perform the procedure to produce the test tube baby “ Durga” (alias Kanupriya Agarwal ) on October 3, 1978. Facing social ostracisation, bureaucratic negligence, reprimand, and insult instead of recognition from the Marxist West Bengal Government and refusal of the Government of India to allow him to attend International conferences, he committed suicide in his Calcutta residence in 1981. His feat has been given belated recognition as the Indian physician who in 1986 was “officially” regarded as being the first doctor to perform in-vitro fertilization in India. His reinstatement to glory is attributable to Professor T.C. Anand Kumar who is credited to be the mastermind behind India’s second (officially the first) test tube baby. Professor Kumar took the crown off his own head after reviewing personal notes of Dr. Subhash Mukhopadhyay. 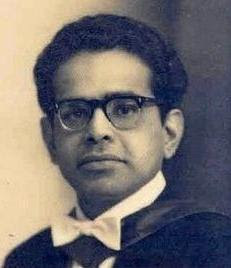 Professor Sunit Mukherji, who was a one time colleague of Dr. Mukhopadhyay, ably helped him. Professor Kumar is currently active in setting up a Research Institute in reproductive biology in memory of Dr. Mukhopadhyay. In this blog first and the third picture is not scientist Dr.Subhash Mukhopadhyay's picture. The person in those pictures is the famous Bengali poet Subhash Mukhopadhyay.